Washing strawberries is a bit of tricky business. You see, strawberries are frighteningly like sponges—they tend to soak up as much water as they can get into contact with. The primary rule about washing strawberries is simple: wash strawberries when, and only when, you're ready to eat or cook with them. Washing strawberries ahead of time only introduces moisture that wasn't there before and will make them go bad much faster. If you have strawberries you're not ready to eat yet, store them properly. When, and again, only when, you're ready to eat or otherwise make use of the strawberries, put the berries in a colander and quickly rinse them with cool water. This is enough to get any dust off of them. Then spread the strawberries in a single layer on a clean kitchen towel or layers of paper towels and pat them dry, as quickly as possible. They are now ready to hull, slice, or otherwise serve and use. But These Berries Have Dirt on Them! 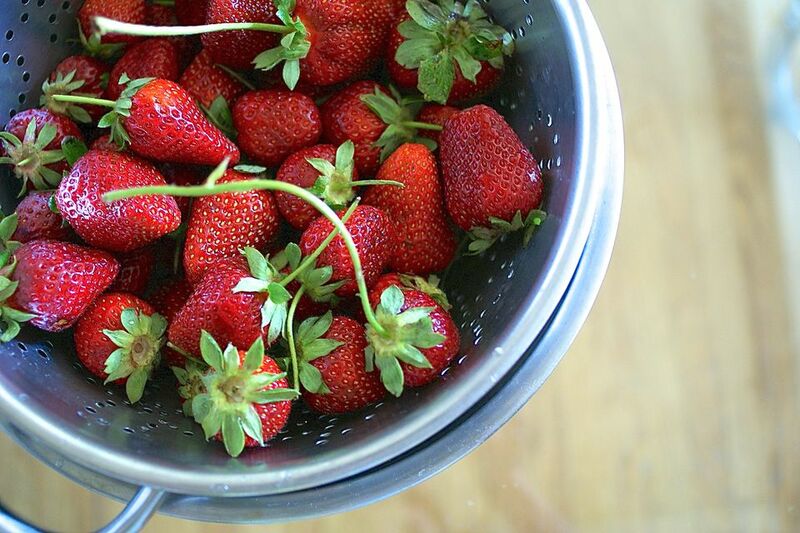 If it's rained recently and the strawberries you've bought or picked have actual dirt on them, go ahead and fill a sink or large bowl with cool water and swish the strawberries around in the bowl until they're clean. Lift the strawberries out of the water (leaving any dirt or grit behind) and lay them in a single layer on a clean kitchen towel or layers of paper towels, pat them dry, and proceed with your strawberry eating or strawberry recipe. Not to be preachy, but much as they like to soak up water, strawberries are adept at soaking up other things, like pesticides. You may want to make sure to buy strawberries that haven't been sprayed with toxins. You can look to buy strawberries directly from farmers at farmers markets. If you're unable to question the grower directly, you can always look for certified organic strawberries, which won't have been exposed to synthetic pesticides. When you buy great berries, you really only need to rinse the dust or dirt off of them. A fabulous way to use strawberries at any house, once everyone is done just eating them plain, is to make a Strawberry Fool. It's just whipped cream and berries, but it tastes like a whole lot more effort. Remember, strawberries aren't just sweet. Well, they are sweet, but they have just a tiny bit of acid that makes them worth using in savory recipes, too. Strawberries make sweet and juicy additions to salads—think of them as springtime tomatoes. Another savory favorite is to use strawberries as a base for a salsa—chop up a pint of strawberries, add a chile or two, a spritz of lime juice, and salt and pepper to taste—that works well with grilled chicken or fish. Just have too many berries to eat? Learn how to freeze strawberries—it's as easy as putting them in the freezer.